Owing to our enriched industrial experiences, we are devoted towards offering a wide variety of Punjabi Suits. 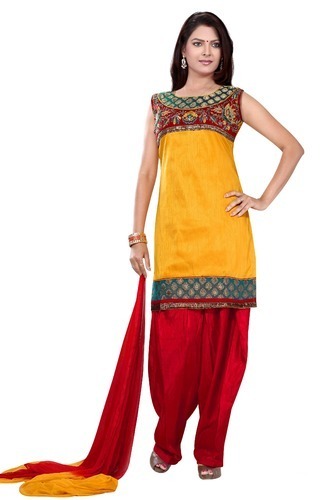 The provided suit is precisely designed using excellent quality fabric and latest machines. Offered suit is available in various beautiful colors as per the variegated demands of our precious clients. Further, to avoid any defect, our experienced quality experts check this suit against different quality parameters. Note: Prices are negotiable as per requirement. We "Ruby Enterprises," are catering emerging demands of market by manufacturing, trading and supplying wide array of Anarkali Suits, Designer Suits, Party Wear Suits, Punjabi Suit, etc. Since our inception in 2005 at Surat (Gujarat, India), we have established an advanced infrastructural base in order to design suits. Our infrastructural base comprises structural divisions such as procurement, designing, quality control, sales & marketing, warehousing & packaging and transport & logistic. The designing division is equipped with crucial machinery, equipment and tools to design ladies suits as per the latest fashion trend. Our fair business policy, quality-centric approach and timely delivery of products have given us huge success in apparel industry. Additionally, we also provide Men's Thobes. We are offering our products under the brand name Khushi, Bela, etc.